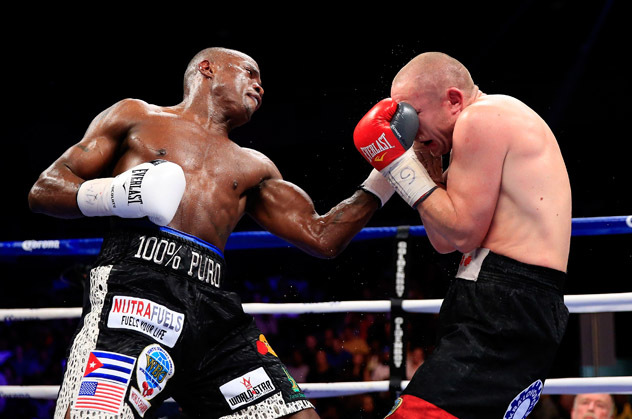 WASHINGTON — WBO middleweight titleholder Peter Quillin had made a point that he would be after what would be his 13th knockdown over his last five fights, if not a stoppage over challenger Lukas Konecny. Peter Quillin (L) throws an uppercut at Lukas Konecny on the April 19 undercard of Bernard Hopkins vs. Beibut Shumenov in Washington, D.C. Photo byRob Carr/Getty Images. Although Quillin (31-0, 22 knockouts) got neither against Konecny (50-5, 23 KOs), who never has been stopped, he unanimously decisioned his man — 119-109, 119-109 and 120-108 — on Saturday night at the D.C. Armory on Showtime. Quillin had Konecny bleeding from the nose in the eighth, and from over the right eye in the 10th, but his fight drew little in the way of reaction from fans until they began to boo him in the 10th. "He was a tough customer and came to fight, and that's what the fans want to see. I'm here to inspire kids. That's my mission and goal. We can always throw more jabs. There are tons of things that I can do. I will go back home and watch the tape and see what else I need to do." "I was looking for a knockout, but it didn't happen. If Danny Jacobs is next, let's do it. I'm also interested in fighting the winner of Sergio Martinez and Miguel Cotto, or Julio Cesar Chavez and Gennady Golovkin." Quillin-Konecny was the opening bout of a tripleheader whose main event matches IBF light heavyweight beltholder Bernard Hopkins (54-6-2, 32 knockouts) against WBA counterpart Beibut Shumenov (14-1, 9 KOs). Between Quillin-Konecny and Hopkins-Shumenov is a welterweight bout between IBF titleholder Shawn Porter (23-0-1, 14 KOs) and Paulie Malignaggi (33-5, 7 KOs). A 35-year old making his debut on American soil, having fought mostly in his home country, the Czech Republic, Konecny was after his third straight win since falling by unanimous decision to Zaurbek Baysangurov by unanimous decision in 2012. In succession, Quillin had floored Winky Wright once during a unanimous decision in June 2012, dropped Hassan N'Dam six times during a unanimous decision for the belt in October of that year, scored four knockdowns in a seventh-round knockout of Fernando Guerrero last April, and one more in during a 10th-round stoppage of Gabriel Rosado in October. Quillin was workmanlike, but not dazzling against Konecny, whom he out-landed, 403-to-197. "There was nothing that I didn't expect. I would have expected a harder fight. Quillin is a good champion and a good fighter, but not a great one," said Konecny. "He definitely beat. I hope to continue to fight in America." Quillin out-landed Konecny, 32-6, in the first round, where the challenger approached behind a high-guard — elbows tucked in close and his fists high around each of his ears — but rarely punched. Konecny drove home a couple of nice uppercuts in the second round, where he was, nevertheless, outworked yet again.Konecny had more success in the third, where he occasionally trapped Quillin on the ropes and landed uppercuts and overhand rights against the countering Quillin. In the fourth, Quillin kept the fight more in the center of the ring, pumping his jab with success and driving home the occasional body blow. Quillin spun off the ropes nicely during one exchange, and at round's end walked to a neutral corner and shouted something to fellow middleweight Danny Williams, who was working as a ringside commentator. The fifth and sixth rounds were more of the same, with Quillin going more to the body. By the seventh, it was clear that Konecny was feeling the body shots and uppercuts as he wobbled, noticeably, back to his corner at round's end. The eighth was mostly one-sided for Quillin, who bloodied Konecny's nose with a hard right hand in the middle of it. The ninth was more of the same.